Product prices and availability are accurate as of 2019-04-11 12:04:11 EDT and are subject to change. Any price and availability information displayed on http://www.amazon.com/ at the time of purchase will apply to the purchase of this product. This is an Airfix 1/72 scale assembly and painting required plastic model kit of the North American F-86 Sabre (a.k.a. the Sabrejet), a transonic jet combat aircraft of the United States Air Force that flew to immortality dueling Soviet made MiG-15s in the first jet versus jet dogfights during the Korean War. 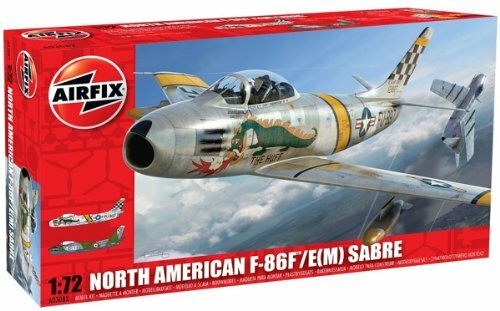 Model kit features: Non-slatted '6-3' wing variant or NATO 'E(M)' version. Kit features engraved panel lines, basic cockpit with seated pilot, optional position landing gear, weighted tires, choice of 2 nose wheel patterns, optional position speed brakes, 2-piece canopy and external stores (2 each drop tanks and 1000 lb bombs). Decals and painting guide for 2 aircraft: s/n 51-2897 'The Huff' of the 39th Fighter Interceptor Squadron USAF, Suwon AB, Korea, June 1953 and No 19766 of 4° Stormo, Aviazone Militaire Italiana, Grosseto, Italy, 1958 - includes instrument panel and console markings plus full stencil data.